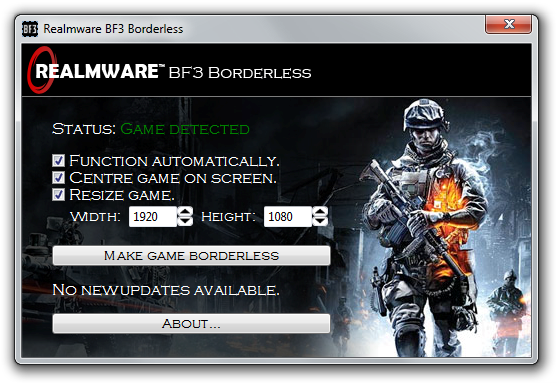 I am pleased to announce that we are now releasing version 1.1 of our BF3 Borderless tool! This update includes some important bug fixes and the ability to minimise to the system tray. BF3 Settings Editor 2.1 released! 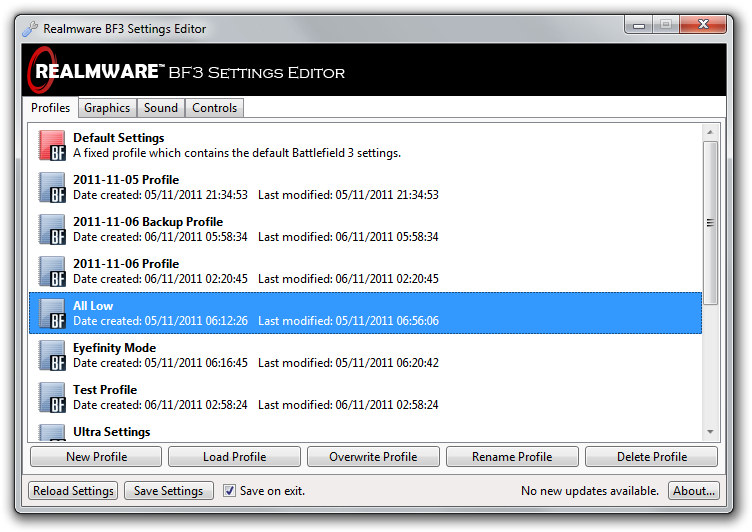 It’s only been a couple of days, but we are now releasing version 2.1 of our BF3 Settings Editor! This release does not contain big feature changes like the previous version, but it does include some important bug fixes and enhancements; we recommend that everybody updates to 2.1. BF3 Settings Editor 2.0 released! 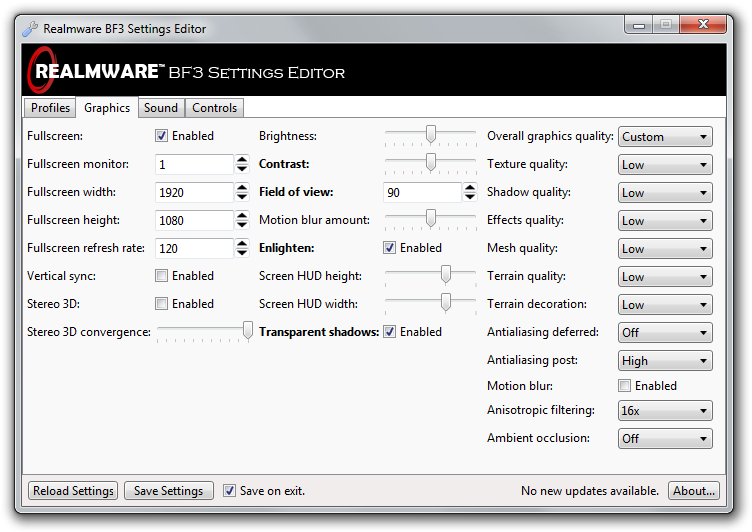 I am pleased to announce that we are now releasing version 2.0 of our free BF3 Settings Editor! This is a major update, including several important bug fixes as well as support for setting keyboard, mouse, and joystick bindings. BF3 Settings Editor 1.0 released! The first version of our BF3 Settings Editor has been released! This has been tested to work with the current version of Battlefield 3. BF3 Settings Editor, as you may guess from the name, allows you to customise your Battlefield 3 settings without having to launch the game. This can save you a lot of time, not only because the game can take a long time to load, but also because you need to log into both Origin and Battlelog before you can start it! We are still working on this program and will be continuing to release updates for it. Planned features for future versions of our BF3 Settings Editor include the ability to modify your key bindings, vehicle sensitivities, and saved kit loadouts. Two screenshots of this program are included below. If you would like to see more, then check out the screenshots page on our BF3 Tools microsite. 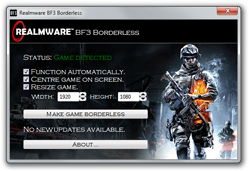 The first version of our BF3 Borderless tool has been released! This has been tested to work with the current version of Battlefield 3. BF3 Borderless is a simple program which gives you control over the window that Battlefield 3 runs in. The main purpose of this is to run Battlefield 3 in a borderless “fullscreen” window. This has the advantages of both worlds: you can make full use of your screen space, and can also easily switch to other programs. If you have played games such as Left 4 Dead, then you may already be familiar with this and can appreciate the benefits it brings. The first version of our Battlelog Standalone tool has been released! This has been tested to work with the current version of Battlelog, which it fully supports. Battlelog Standalone is a simple program which provides access to the Battlelog website through a kind of simplified web browser. 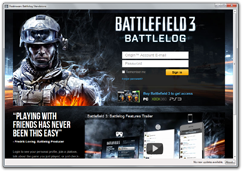 Its aim is to simplify the process of accessing Battlelog, and save system resources while playing Battlefield 3. The more tabs you have open, and the more extensions you have installed in your web browser, the more system resources you will save by switching to this tool. Battlelog Standalone supports the Battlelog browser plugin, and also fully supports VoIP and connecting to games. 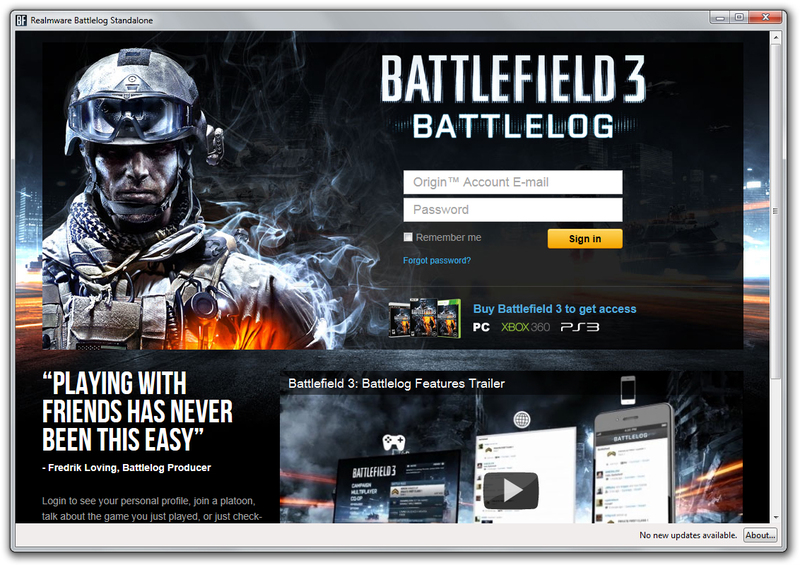 Many people have complained about the game’s requirement to use Battlelog, and have stated that they use other web browsers as dedicated “Battlelog viewers”. Our program is especially aimed at these people, and we hope it will make using Battlelog a more convenient and enjoyable affair. Today we are releasing three utilities for the popular game Battlefield 3: BF3 Settings Editor, BF3 Borderless, and Battlelog Standalone. We hope that the Battlefield 3 community will find these tools to be useful, and we will work hard to provide updates to them in the future. To make it easier for Battlefield 3 players to find our tools, and to host all of the relevant information about them, we have set up a dedicated website. For more information, check out our new BF3 Tools microsite.